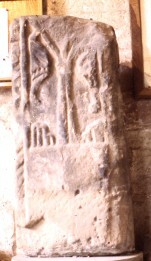 This side of the shaft shows the Tree of Life. The trunk is in the centre with a branch springing from it on either side. Both branches have a large leaf with a little curl on the lower end.